Posted 6/2/2017 9:32am by Paul Nehring. If you were going to build a house or needed surgery, or needed get your car repaired, would you hire someone off the street, with no experience to do the job? Not likely, right? For instance, if were looking for a contractor to build a house you would probably hire someone with the right qualifications: a high skill level, developed through years of experience with good instruction; someone who has the right tools; uses high quality materials; builds with craftsmanship; and who treats you with honesty, integrity, and respect. If you are skilled professional you know the same ingredients go into making anything of quality. Isn't the same thing true for grass-fed beef? If so, doesn’t it make sense to look beyond price and convenience if you want good quality beef. The grass-fed beef market is growing fast, at around 30% per year, and lots of people and branded beef companies are getting in on the action. While it’s great to see the beef industry making the change from industrial scale feedlots to grass-fed, the problem is that demand for grass-fed beef production has meant that lot of “grass-fed” meat is hitting the marketplace that is not high quality, because it is not raised by producers who have the capability to do it right. The fact is, not all beef is quality beef, as quality can vary dramatically, especially for grass-fed beef, which requires a high degree of skill. It takes a long time, 18-24 months to raise grass-fed and grass-finished beef. There are a number of variables that go into creating good quality grass-fed beef. Despite that there are no requirements to raise and sell grass-fed beef. There are no required training programs, no certification programs, there is not even a legal definition of grass-fed beef. Anybody can raise a cow and call it grass-fed beef. In other words, the grass-fed label is no indication of quality. If you are a looking to purchase truly grass-fed beef of good quality, doesn’t that make you a little bit concerned that you are getting what you pay for? Doesn’t it make sense, then, that when it comes to grass-fed beef, it’s worth taking the time to find a farmer/rancher/beef producer whom you can trust, because you know he/she has the skill, the tools and materials (good cattle genetics, pasture, hay, machinery) and does the right things to raise exceptionally good beef. The genetics of the animal—different breeds will have different flavor and meat attributes, such as differences in tenderness, leanness, marbling and muscle structure. Additionally, within each breed there are genetic lines that produce better beef. In other words, just because it’s Angus doesn’t mean it’s good. There are good genetics and bad genetics within the Angus breed, or any other breed. A conscientious beef producer learns how to discern which cattle will work for their environment to produce good quality meat. What the animal eats, and drinks throughout its lifetime. Feedlot cattle eat a relatively bland diet of starches, such as flaked corn and soymeal, which provide lots of energy to fatten the cattle quickly, but don’t add much to flavor. On the other hand, when cattle are eating pasture, there are many different plants in the salad bar mix contributing a great deal to flavor in the meat, as plants contain terpenes, which are volatile compounds found in herbs in spices, as well. It is essential, however, that the cattle be on well-managed, high quality pasture managed for peak nutrition. That comes from selecting the right plants—we typically plant a 10 or more, in our pastures such as red clover, white clover, ladino clover, alfalfa, chicory, and a variety of grasses which all provide different types of nutritional compounds, and flavors. Cattle are moved into new sections of pasture daily, allowing us to provide pasture that is at peak levels of nutrition. Just as essential, when cattle are moved off of the daily pasture section, the plants in that section then have time to rest and recover to regain high levels of nutrients before being eaten again. This practice benefits the health of the plants, the soil, the animals, and the quality of the meat. Unfortunately, many grass-fed producers neglect to manage for high quality pastures. They don’t bother planting beneficial species of plants, and they don’t manage the pasture to maintain peak nutrition, because this takes a lot more effort. It is much easier to just put cattle in a large area of pasture and forget about them until it is time to ship them out. I call this the “Columbus method” of raising cattle: that is, put the cattle out to pasture in the spring time and go rediscover them in the fall, when its time so sell them. Suffice it to say, the Columbus method does not yield quality beef. If cattle are mostly eating poorly managed pasture they won’t get the nutrients they need to properly grow, finish and stay healthy, and consequently meat quality will suffer dramatically. During time of stress, such as cold, wet weather, the animal on poor pasture will burn fat and muscle to compensate, eating up nutrients such as glycogen needed to properly age meat. Hay, for wintertime feeding, is every bit as important. Hay needs to be high quality, made at the right time, and stored properly to prevent mold. This is another area where many producers skimp, as they make hay when they have time, not when the plant is at ideal stage for cutting. Or they buy in cheap hay, which is low-priced because it is of poor quality or moldy. Again, the animal can’t get the nutrition needed out of the hay to grow and maintain healthy levels of fat. The soil that produces the forage that the animal eats. Soil health is imperative to producing nutrient dense forages such as pasture and hay. That means soils fertility should be maintained. That includes maintaining high levels of organic matter, which is essentially decaying plant matter left behind after grazing, which helps feed soil critters. That’s right, we need to feed the soil “livestock,” as well, and we do that by leaving some pasture behind, that the cattle have stomped into the ground. Some farmers would see that as waste, but we see that as essential to creating healthy soil. When there is an abundance of well-fed soil life, the nutrients in the soil are much more available to plants. The way the animal is handled, from birth right up to the end, will positively or negatively affect the quality of the meat. Cattle can be stressed by poor stockmanship, which can make them feel lousy, and even create sickness—just like negative stress does for us. However, good stockmanship can alleviate stress, improving health, and production. Good stockmanship, or cattle handling, is an art form that takes proper instruction, years of practice, and a good attitude to master. Yet, few livestock producers ever bother to learn basic principles of stockmanship. Instead, they force cattle do what they want them to do, which creates stress. I consider myself a lifelong student of good stockmanship principles, and have attended stockmanship schools taught by some of the best in the business. After many years of practice, I now even teach stockmanship to others because I believe it is so fundamental to good, humane treatment of cattle. Beef aging. Beef has the benefit of containing enzymes that can, over time, dramatically improve the tenderness of the meat. However, these enzymes need at least 12-14 days to do their work. Most local butchers only age beef for one week, because butchers don’t want to allocate space to age meat for longer than that. Aging beef in climate controlled coolers takes space and costs money, so most of the beef on the market is not dry-aged for long, if at all. Instead, it is packaged in plastic and any aging that is done is during transit to market, or when it sits on the store shelf. Wet-aged meat, however, can develop metallic off-flavors as the beef ages in it presence of its own juices. If beef is too lean, and has no backfat, which is true of much of the improperly raised grass-fed beef on the market, it should not be aged for long. The meat will dry out too much, and certain types of mold, though harmless to our health, that are normally trimmed off with the fat, will grow into the meat, creating fishy flavors in the meat. Newgrass Farm beef, on the other hand, is finished properly and is dry-aged for 21 days, or more, if requested. Not only does the dry-aging improve tenderness, it also concentrates flavor, providing a more robust, beefy flavor. In fact, if you would like your half or whole beef to be aged longer, you can do so. You can age the carcass or just the primal cuts such as ribeye and NY Strip for as long as you want. A skilled butcher. Without a skilled butcher and good relationship between butcher and meat producer, everything else done up to this point is worthless. We have worked for many years with our butcher, Andy Geiss, owner of Geiss Meat Service, to develop the aging system, cutting, and packaging that provide you with good quality meat that you expect. Last, but not least, the way the beef is cooked. We provide you with support such as cooking methods and recipes, and try to answer any questions about how to cook something. Without a doubt, high quality beef production takes skill and the right ingredients: good cattle genetics, well-managed pasture, high quality hay, good cattle handling, proper aging, and a good butcher. If you are looking for great tasting, grass-fed beef, that’s raised by someone who takes the art of beef production seriously, give our beef a try. Interested in finding out more? Please give us a call or send an email. I would be glad to talk to you. Posted 6/2/2017 9:17am by Paul Nehring. 2. Standards are voluntary: There is a USDA grass-fed standard, but it’s a voluntary standard, meaning that it is not legally defined, nor legally enforced. While there is a standard, meat sellers can apply for the grass-fed claim even if they do not meet those standards, as long as the USDA/FSIS agrees to their claim. For instance, in 2015, Sysco applied for a waiver to import Irish beef and call it ‘grassfed” despite the fact that the cattle were fed grain during the winter. Their excuse was that it’s cold in Ireland in the winter, and Irish cattle need grain to do well. [iii] They were granted their waiver. I find that strange, because it’s every bit as cold in Wisconsin during the winter, but our cattle do just fine on high quality hay—the reality, is that it costs more to feed high quality hay than it does to feed grain, and animals finish quicker on grain, again reducing cost. 3. Using the term grass-fed on a label requires one simple step. There is one step required to label beef as grass-fed: The beef seller must submit an affidavit to the USDA/FSIS or their state meat inspection service (DATCP in Wisconsin). That affidavit is simply a sheet of paper explaining how the cattle were raised and why they qualify as grass-fed. If the USDA or state inspection service approves of your affidavit you can then add the term grass-fed on to your label. Neither the USDA nor the state inspection services actually inspect the farms/ranches where the cattle are raised. [iv] Let’s face it, anyone can raise and/or sell grassfed beef. You don’t need any skill, or any certifications, or training, and you don’t even need to be a farmer or rancher. Just buy some cattle, send them to a butcher and label the meat as grass-fed. Yeah, it’s that easy. 4. The vast majority, 75%, of grass-fed beef on the market at grocery stores, and restaurants is imported. [v][vi] 5. You can’t tell if beef is imported. Imported beef can still be called “product of the USA” if it undergoes any kind of processing or packaging in the U.S. That means the four big multinational meat packing companies, that control 80% of U.S. beef trade, can bring in beef from anywhere in the world, repackage it in the U.S, and call it a “product of the USA.” You can thank Congress for that when they ended COOL, Country of Origen Labeling, in 2015. 6. There is little accountability in the system. Since nobody is doing inspections for grass-fed, and there is high demand, and a premium paid for grass-fed beef there is likely widespread fraud in the industry, but nobody really knows just how much is happening. It’s relatively easy to purchase some cattle, put them on pasture, call a purchaser for a branded beef company that buys “grass-fed” and tell them that the cattle are grass-fed. 7. Meat is packaged in carbon monoxide. Those cryovac packs of "fresh," unfrozen beef are injected with carbon monoxide, which helps the meat stay pink, instead of turning brown, for long periods of time. Just because the meat is pink does not mean that it is "fresh." In fact, it could be over 45 days old on the store shelf. Color is not a good way to know if these packages of meat are still good, because they can keep their color for over two years, despite the fact that meat has spoiled. Europe and Japan ban this practice. 8. No product consistency. Branded beef programs purchase from a large number of farms/ranches with varying levels of skill, and different types of cattle and grass. That means there is little consistency in the beef, especially in terms of marbling, tenderness and flavor. 10. No restrictions on hormone use or antibiotics. Those grass-fed feedlot cattle might also be injected with hormones, and other drugs during their stay to increase growth. With all of these issues doesn’t that make you a little bit concerned that you are getting what you think you are getting when you purchase grass-fed? If you are a looking to purchase truly grass-fed, antibiotic-free, hormone-free beef of consistently good quality, raised and processed locally, give us a try at Newgrass Farm, where you will find delicious, customer-inspected, 100% grass-fed. dry-aged, Angus beef. Support your local farmers, instead of deceptive multinational corporations. Is that Local, Grass-fed Burger Really Local and Grass-fed? Posted 3/13/2015 9:35am by Paul Nehring. In the past few years two of the biggest, most promising trends in the food business are “local” and “grass-fed.” In fact, the demand for these products is growing so fast that demand often outstrips supply. Unfortunately, too often when that happens, food retailers, not wanting to lose customers, will cut corners or stretch the truth just a bit, or sometimes a lot, to make you think you are getting what you want. That same thing is what is happening in the local, and grass-fed beef business, at farm markets, grocers, and now, especially with restaurants. 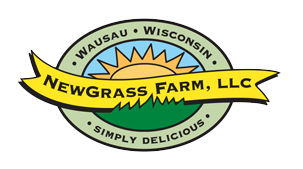 For instance, you may have noticed that some Wausau area restaurants now claim to offer local grass-fed beef on their menu. Yet, to the best of my knowledge, none of those restaurants is actually sourcing their beef from a local grass-fed producer or producers, and in fact, I know at least one restaurant that was purchasing beef from a local butcher and was calling it locally raised, grass-fed beef, when in fact, the butcher purchased that beef a meat packer which sources all of their beef from feedlot raised cattle—the butcher is local but the meat is not, nor is it grass-fed. Some other restaurants that are claiming to sell local grass-fed beef are actually sourcing it from branded beef companies that are not what most of us would call “local.” One restaurant, Redeye Brewing Company, gets their grass-fed beef from a branded beef company in Southern Illinois, but to their credit, they don’t label that meat as local on their menu, just grass-fed—hey, I’m fine with that, because it’s honest. Another, Great Dane Brew Pub sources their “local, grass-fed” beef from Northstar Bison in Rice Lake, WI. Northstar Bison purchases their grass-fed beef from growers in Northern Wisconsin and Minnesota. At least they are somewhat from Wisconsin, but not exactly local. It’s hard to blame the restaurants for not sourcing all their meat from local sources, because there just isn’t nearly enough supply. I’ve been in the meat production business on our farm, for over 10 years, and I’ve been involved with all the local farm markets in the area, and I have a pretty good knowledge of the local supply of grass-fed beef. While local grass-fed beef production is increasing, growth is slower than you might expect. On the supply side there are some very real challenges to produce enough grass-fed beef right now. The reason is that is that cattle prices have increased so much the past few years that we haven’t been able to come up with the capital to expand our production. Cattle are now selling for 200 to 300% higher than they were just five years ago. While we raise many of our cattle from birth, we also purchase weaned calves, at about 6-7 months of age, and raise them until they are 20-24 months. Those calves come from local grass-fed farms, and we pay the going rate. In 2008 I purchased calves for an average price of $450 per head. In November of 2014, I had to pay over $1500 for those same weaned calves. We have been creative with sourcing outside capital, but it’s only been enough to keep a steady supply, rather than an increasing supply. We used to work with some local restaurants but have had to drop all of those accounts because we couldn’t afford to purchase enough cattle to service them. It’s frustrating for us that we can’t come up with the capital to grow our supply to meet demand, especially when local restaurants want that beef. However, it’s an unusual time in the cattle business and unless we can find additional investors to finance growth, it’s not going to happen. We can’t take out a third mortgage on our home, and even if we could it’s not worth the risk. My wife and I are already both working jobs off the farm to finance this business and keep it afloat, as well as to pay for our living expenses, so there aren’t easy solutions to this. I imagine it is frustrating for chefs that they can’t find local sources of grass-fed beef when their customers are increasingly asking for it, and expecting it. And we can’t blame chefs for not sourcing local grass-fed beef, because they just can’t find enough of it for regular menu items like burgers and steaks. However, I don’t believe that just because local grass-fed beef is in short supply that it justifies lying on your menu by suggesting that the beef is local and grass-fed, when it is not local or in some cases, not even grass-fed. While local and grass-fed may be trendy shouldn't honesty and integrity be the most important ingredient on the menu? My suggestion is that if you are dining at a Wausau area restaurant that claims to have local grass-fed beef on the menu, ask what local farm or farms they are sourcing the beef from, and where those farms are located. I’d be curious to know what you find. You can email me or post it on my facebook page. My suggestion to chefs is to be true to your menu. I’ve found that people appreciate the truth far more than anything else you can give them and that trust builds confidence in you and your business. I hope that you realize that the local foods movement is based on honesty and transparency, so that customers can know where their food comes from and how it was raised. Posted 1/10/2014 3:24pm by Paul Nehring. Every New Year brings two proud traditions: Making resolutions and then, shortly thereafter, breaking them. Often the full cycle doesn’t take more than a few weeks, which allows well over 11 months to plot the next year’s resolutions. 1. Look for your bright spots. Nwokedi Idika, an American graduate student in computer science, was a chronic procrastinator. He’d set a goal to work six hours per day on his thesis but found that he only hit the target sporadically. Rather than bemoan his failures, though, he examined his bright spots: What is different about the days when I do manage to complete my six hours? And what he discovered was that, in almost every case, he’d been working early in the morning. So he turned that realization into a strategy: He started setting his alarm for 5:30am every morning. 2. Make one change at a time. Over the last 15 years, a series of studies in psychology has confirmed a sobering result: Our self-control is exhaustible. The research shows that we burn self-control in many different situations: when controlling our spending; holding in our emotions; managing the impression we’re making on others; resisting temptations; coping with fears; and many, many others. 3. Turn that one change into a habit. He resolved to create a daily routine: Every morning, like clockwork, he’d finish one task. “Once I’m on a roll, it seems easy to carry on. I remember to look at my list for today’s task because I’m used to doing it, and I almost look forward to ticking off that day’s chore,” he said. Habits are effective because, once established, they no longer burn self-control. (Think about how little mental energy it requires to take a shower, or make your morning coffee, or to carry out any of the other habits you’ve acquired.) You’ll be more likely to keep your resolution if you can turn it into a habitual behavior—something that happens in the same time and place on a regular cycle. 4. Set an “action trigger” to start your habit ASAP. What’s the best way to start a habit? Let’s say you’re trying to exercise more. You might declare to yourself:Tomorrow morning, right after I drop off Elizabeth at dance class, I’ll head straight to the gym for my workout. Let’s call this mental plan an “action trigger.” You’ve made the decision to follow a certain plan (exercising) when you encounter a certain trigger (the school’s front entrance, tomorrow morning). Action triggers like these can be surprisingly effective in motivating action. The psychologists Sheina Orbell and Paschal Sheeran studied a group of patients in England with an average age of 68, who were recovering from hip or knee replacement surgery. Some of them were asked to set action triggers for their recovery exercises—something like, “I’ll do my range-of-motion extensions every morning after I finish my first cup of coffee.” The other group did not receive any coaching on action triggers. The results were dramatic: Those patients who used action triggers recovered more than twice as fast, standing up on their own in 3.5 weeks, versus 7.7 weeks for the others. Psychologists have compared action triggers to “instant habits” because what they do, in essence, is make our behavior automatic when the trigger moment comes. Seize that power for yourself: Jump-start a new habit by setting an action trigger. Good luck with your Resolutions, everyone, and here’s hoping for a fantastic 2014!